12 May 2004, Geneva – The Secretariat of the Convention on International Trade in Endangered Species of Wild Fauna and Flora (CITES) has received over 50 proposals from its member governments to adjust the rules governing the international trade in various wildlife species. 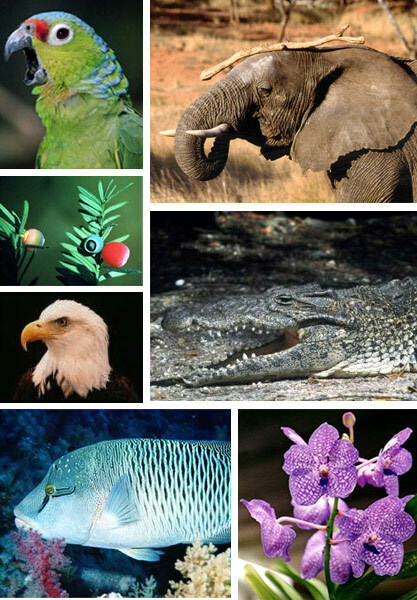 The proposals offer detailed arguments on how to improve the conservation and sustainable use of the African elephant, the minke whale, the great white shark, various tropical birds, trees and orchids, numerous turtle species, the southern white rhinoceros, two species of crocodile, the bald eagle, several medicinal plants and many other species. Governments will accept, reject or adjust these proposals for amending the CITES Appendices at a conference in Bangkok from 2 – 14 October. These Appendices list species that are at risk and whose import and export is controlled through a permit system (Appendix II) and species that are already endangered and that may not be commercially traded (Appendix I). The African elephant is a regular feature of the CITES agenda. Following a 1989 ban on the international ivory trade, CITES permitted some one-off sales in 1997 and again in 2002. The 2002 sales from Botswana (20 tonnes), Namibia (10 tonnes) and South Africa (30 tonnes) have not yet occurred pending the establishment of baseline data on poaching and populations. Namibia has now submitted a proposal for an annual export quota of two tonnes of ivory. Both Namibia and South Africa are proposing to trade elephant leather commercially in addition to ivory. Japan is recommending that three populations of minke whale be transferred from Appendix I to Appendix II. CITES currently forbids any international trade in whale products. Madagascar and Australia propose adding the great white shark to Appendix II. No sharks were included in Appendix II until two years ago, when the whale shark and the basking shark were added. Marine and freshwater turtles and land tortoises are under various degrees of threat around the world, and many are already listed in the CITES Appendices. Six additional species are now proposed for inclusion in Appendix II. They are the soft-shelled pig-nosed turtle, McCord’s snake-necked turtle, the Malayan flat-shelled turtle, the Malayan snail-eating turtle, the Asian soft-shelled turtle and the flyriver turtle. In addition, the Malagasy spider tortoise is being proposed for Appendix I. Sea animals on the agenda in Bangkok will include the humphead wrasse (a large and valuable reef fish occurring in the Indo-Pacific), south-east Asia’s Irrawaddy dolphin and the Mediterranean date mussel. Birds will include the yellow-crested cockatoo, the lilac-crowned parrot, the peach-faced lovebird and the painted bunting. One of the new proposals recommends transferring the African lion from Appendix II to Appendix I. Other proposals call for easing the trade restrictions on the bald eagle and the southern white rhinoceros and introducing the permit system. The US proposes removing the bobcat, now on Appendix II, from the CITES regime. Three proposals concern crocodiles. Cuba proposes to transfer the Cuban crocodile from Appendix I to Appendix II. Namibia would like to do the same for its national population of the Nile crocodile. Zambia, whose population of the Nile crocodile is already listed on Appendix II, is now requesting an annual export quota of no more than 548 wild specimens. Madagascar proposes adding the leaf-necked geckos and the coloured serpent – considered the country’s most spectacular snake – to CITES via Appendix II. Kenya proposes the same listing for two species of viper. The plant proposals would introduce Appendix II permit requirements for Asia’s commercially valuable agarwood and ramin trees plus a number of Asian trees belonging to the Taxus genus. Also on the agenda are an orchid from Colombia and a cactus from southern Africa. The CITES Secretariat will now review and analyse all of the proposals it has received. It will publish its preliminary technical and scientific assessment of the proposals together with its preliminary recommendations in early June. Thousands of species around the world are endangered as a result of human activities such as habitat destruction, poaching, over-harvesting, and pollution. CITES was adopted in 1973 to address the threat posed by just one of these activities: unsustainable international trade. To date, some 166 countries have become Parties to the treaty, making it one of the world's most important agreements on species conservation and non-detrimental use of wildlife. Even after commercial fishing and the timber industry are set aside, the international trade in wildlife is big business, estimated to be worth billions of dollars annually and to involve more than 350 million plant and animal specimens every year. Unregulated international trade can push threatened and endangered species over the brink, especially when combined with habitat loss and other pressures. CITES accords varying degrees of protection to some 30,000 plant and animal species depending on their biological status and the impact that international trade may have upon them. Appendix I contains fewer than 600 animal species and a little more than 300 plant species, whereas Appendix II covers over 4,100 animal species and 28,000 plant species – seven times as many animal species and ninety times more plant species. Appendix III, which includes species that are protected within the borders of a member country, lists over 290 species.